Yummy Restaurant Week Dinner with Wine/Beer Pairing! Ah! Restaurant Week, you are amazing! Not only do you deliver delicious food to my mouth at a huge discount, you last for WEEKS! Melissa and I hit up one of her favorite spots, Riverpark (http://www.riverparknyc.com/), for dinner. As an aside, Melissa already came here 3 times (!!!) for Restaurant Week. I knew this was going to be a delicious meal! We both ordered the same pasta as an appetizer. 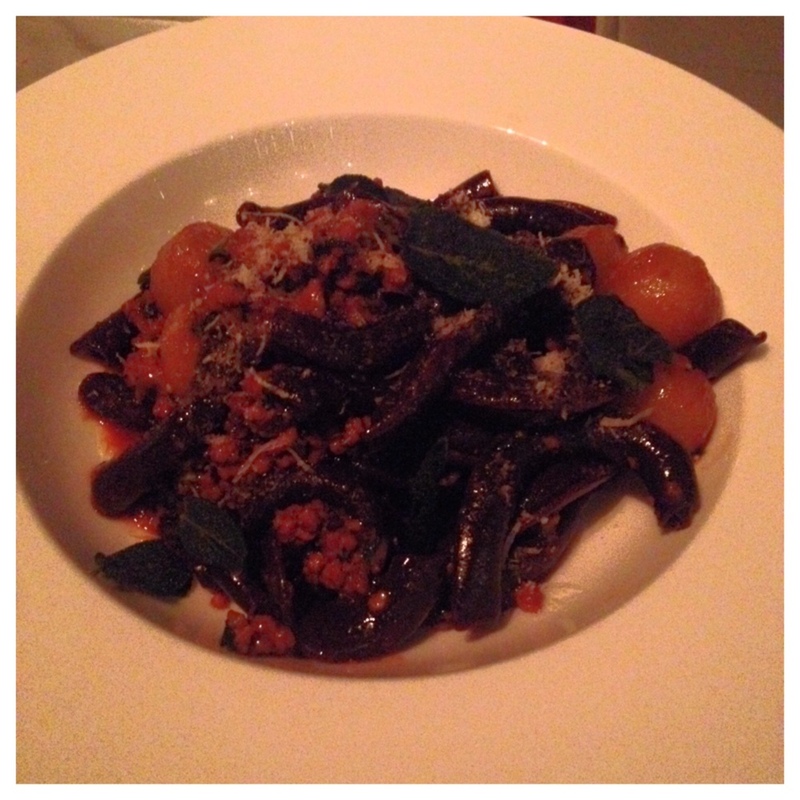 It featured cocoa spaccatelli, pork ragu, Honeycrisp apples and sage. The pasta was tasty! The cocoa was likely added for color as I couldn't taste it directly. Though, the overall profile of the dish was very complex, so I'm sure it added to the taste. After looking at the menu, we found two entrees we both wanted to try. So, we ordered one of each! We got the Whole Roasted Dorade with baby artichokes, capers, fennel and olives and the Cocoa Spiced Pekin Duck with blood orange, fennel, pearl onions, red cabbages and chiles. 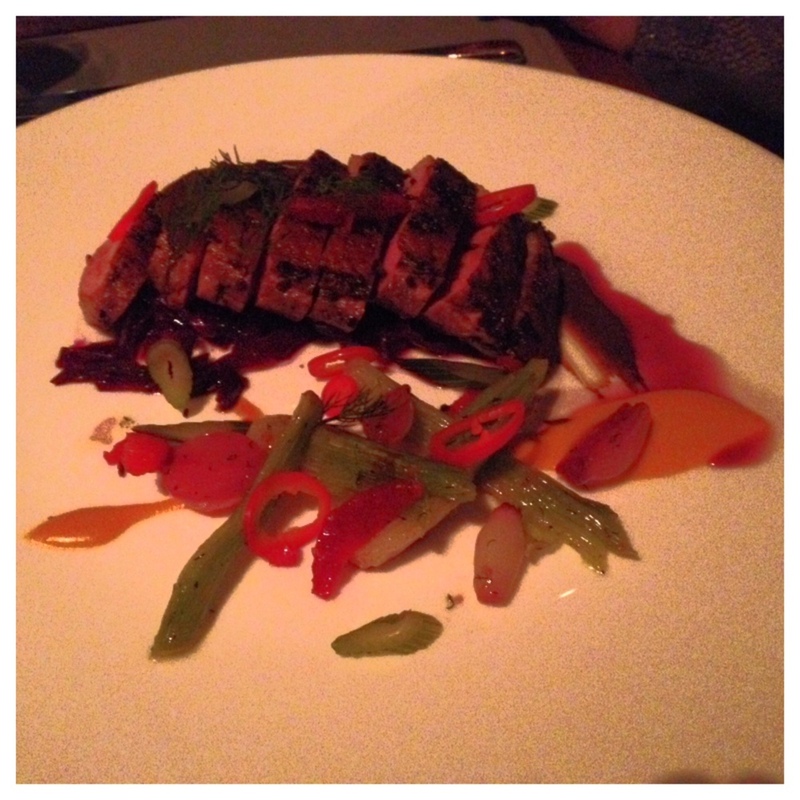 It is hard to pick which of this dishes was my favorite! 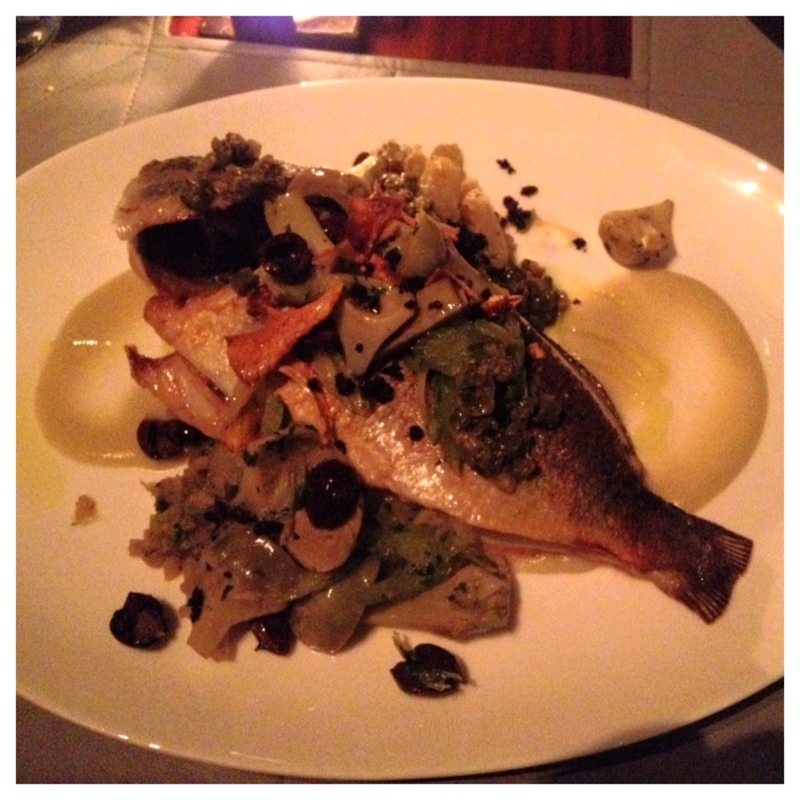 The fish was moist, light and flaky. You can't really tell from the photo, but once you lift it from the middle, the fish was completely deboned and ready to NOM! It is nice to not have to pick out the bones. The assortment of vegetables and spices was lovely and not overwhelming to the fish. The duck was tender and tasted great with the blood orange. For dessert, we ordered "Cereal & Milk" - the restaurant's signature dessert. Melissa assured me that it was worth the $3 upcharge! 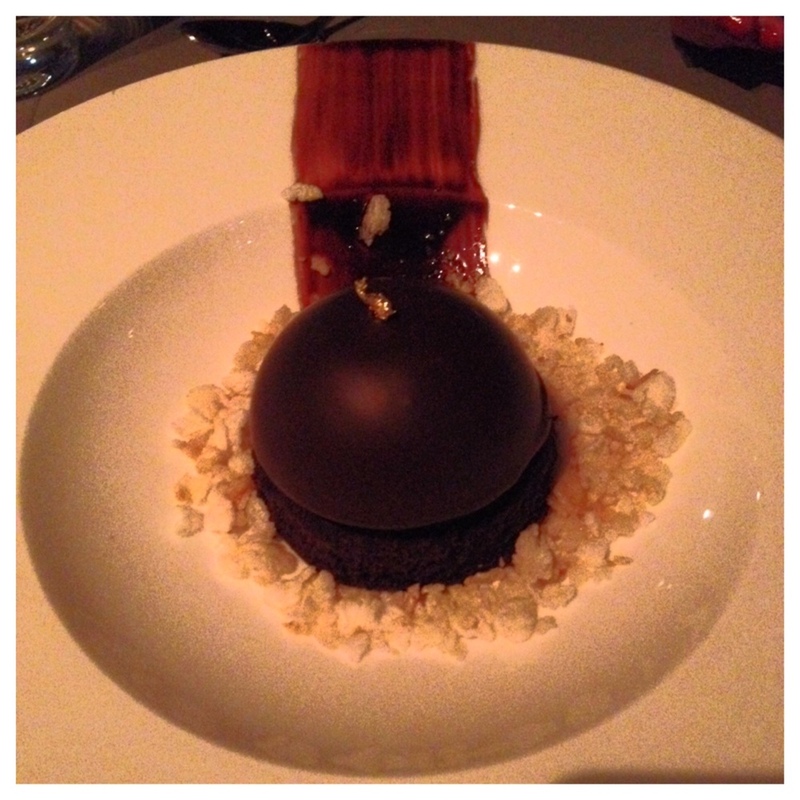 The dessert is composed of a chocolate ganache cake, caramelized rice puffs, and vanilla malt (hidden within the chocolate shell). 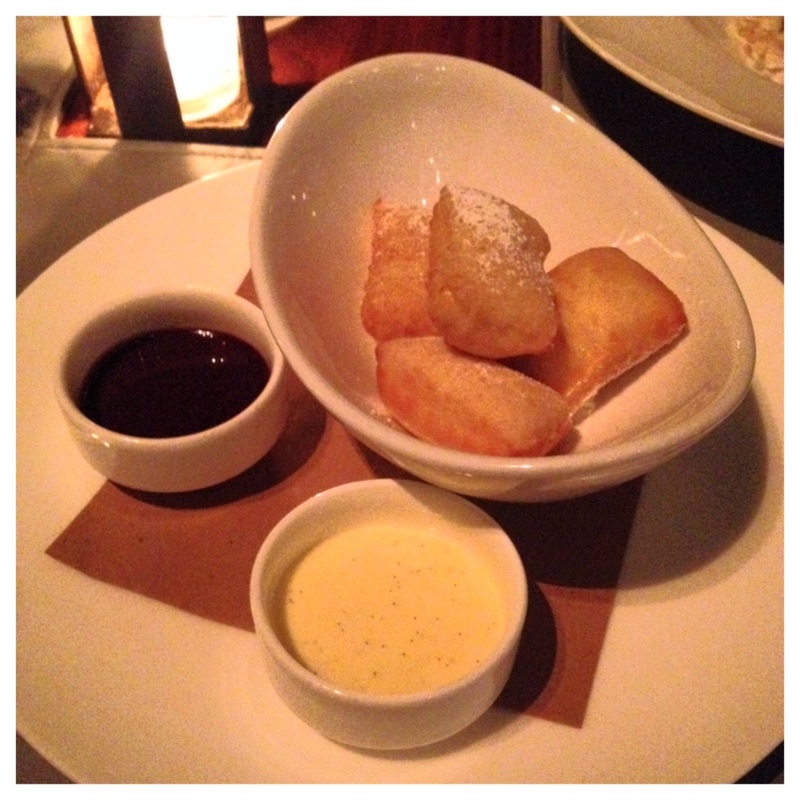 We also got the Beignets that were served vanilla custard and spiced chocolate sauce. We totally messed up and should have ordered TWO Cereal & Milk desserts!!! The beignets were ok but could not stand a chance compared to this delicious dessert. You break the chocolate shell and the vanilla malt inside covers the entire dessert. I should have taken a photo of it after we broke the shell but we were too busy eating it! This is an incredible restaurant with phenomenal food! It is a much better value to come here during Restaurant Week but worth a visit regardless JUST FOR THE DESSERT! After my first Restaurant Week meal at The Marrow, I headed to Junoon (http://junoonnyc.com/) with Scott. I had heard rave reviews about this Michelin-rated Indian spot in Flatiron but couldn't convince myself to go due to the price of the entrees (most protein entrees are $25+) and the size (not very large!). I'm a hole-in-the-wall Indian cuisine gal, but for Restaurant Week I enjoy living on the wild side and indulging! This place opened in 2011 and received one star from Michelin JUST ten months after it opened! Very Impressive. The restaurant was running behind so we each ordered a cocktail at The Patiala Lounge (the bar). I went with the Blood Orange Sour, made with Kentucky Bourbon, Homemade Blood Orange and Lemon Puree, Clove-Campari Reduction with Egg White for Texture. Beautiful Color and Delicious Taste! My cocktail was yummy - I love the taste of Blood Orange Juice, it is like the adult version of OJ! Scott went with the Tandoori Tequila, a spicy cocktail made with silver tequila, lime, muddled Tandoori pineapple, curry leaf and pippali pepper. I sipped his drink and it did have a certain KICK to it! Scott sometimes feels that I don't give him the star power he deserves on my blog, so I took a photo of him. Of course it came out terribly - it is the thought that counts, right? The lounge area is pretty swanky. You feel like you're on the set of a high-budget Bollywood movie. Scott and I have similar taste preferences, so we ordered different appetizers, entrees and desserts and shared everything. As we waited for our appetizers, we were each served an Amuse-Bouche, or complementary tasting from the chef. It was something or other with butternut squash and quite delicious! The sizing was a preview of what was to come...tiny dishes! To start, we got the Lahsooni Gobi (crispy cauliflower with chili flakes and garlic tomato chutney) and Chipotle Chicken Tikka (chipotle marinated chicken with crispy potatoes and lime aioli). Both were delicious but VERY SMALL! If I came here and paid the menu price I would be very disappointed. 3 pieces of cauliflower is a bit lame! I absolutely loved the Shrimp Curry BUT THERE WERE ONLY 3 SHRIMP! WHAT GIVES!!! I felt super cheated. The lamb had more chunks in it but wasn't bountiful by any standards. We also got one order of Pulao Rice and Naan to split. I would have preferred Garlic Naan but we weren't able to upcharge to that which I thought was annoying - you may be sensing a trend! For dessert, we ordered one Rice Pudding served with candied almonds, cinnamon and golden raisons and one Passion Fruit Mousse. I loved the rice pudding but hardly got to taste it - it was about 3 spoonfuls. This is the unfortunate downside of Restaurant Week - going to fancy places and leaving feeling like you want to eat an entire pizza! I'm glad we went because the food was phenomenal it just left me wanting more...FOOD!